When you want to curl up and feel alright but you also need to feed the hustle. Dressing for comfort and confidence is key when I aim to cross more than a few things off my current day's to-do list. When the bullet points add up and stress slowly starts to creep in, I take a break, switch things up, and head out the door to change my ambiance. I love packing my large Hare + Hart tote with my basic office needs — including my laptop, chargers, tea bags, RMS palette, alkaline water in my BKR — and setting up shop in an outdoor cafe or a rooftop hangout for a brand new perspective. It completely resets my mindset and ambition fuels like my matcha latte. I'm also so incredibly proud of one of my dearest friends Jenny Tsang, who engaged her vivacious drive and spirit and started her namesake clothing line byTSANG. Thoughtful in purpose, Jenny released her first piece, the Fuzzy Cardigan Coat, in the most essential colorways. The luxury of snuggling with soft wool and silky satin is why I grab the cardigan every time I'm out the door. 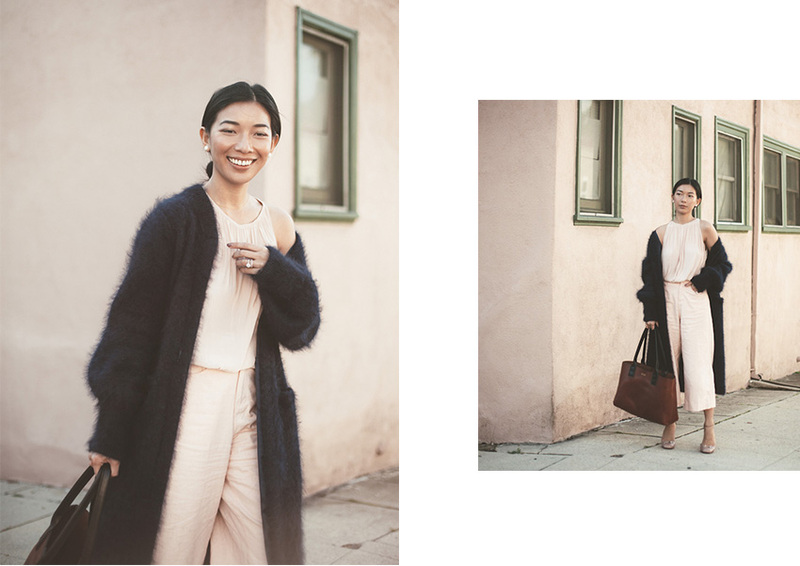 Wearing byTSANG cardigan, Ramy Brook top, Mo:Vint bottoms, Gucci heels, Hare + Hart bag. j'adore le manteau!!! love the coat!! This cardigan is perfection, loving the colour scheme!